There is nothing more comforting and tempting than modern rural British food cooked simply but exceptionally. The recipes in Cook Country are delicious, seasonal, accessible and classy; just what you'd expect from Matt Tebbutt, the chef behind 'Britain's Best Food Pub', The Foxhunter (Saturday Telegraph, 2007). For each month of the year Matt brings us hearty dishes that are true to their season - from cauliflower soup with black pudding & dill to confit of guineafowl and from Eve's pudding to chocolate pudding with mascarpone ice-cream. A new voice in cookery, Matt Tebbutt promises to become a staple on your bookshelves - this is a cookbook to turn to again and again whenever you want to indulge yourself or treat your friends. Matt Tebbutt cooks what so many of us want to eat today: rustic, seasonal and comforting Modern British food. The dishes, many taken from the menu of his award-winning restaurant The Foxhunter, use seasonal British ingredients in recipes inspired by both European and local dishes. The book is based around the seasons and each chapter contains ideas for everyday suppers and more leisurely weekend meals. A new voice in cookery, Matt Tebbutt promises to become a staple on your bookshelves - this is a cookbook to turn to again and again whenever you want to indulge yourself or treat your friends. 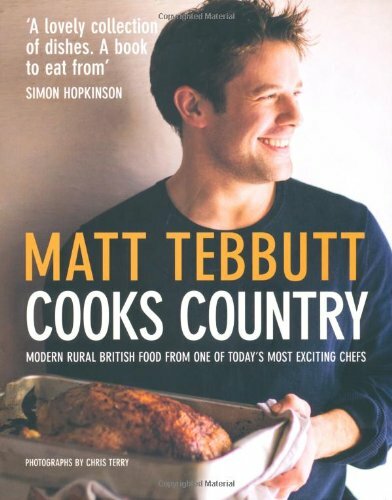 Matt Tebbutt was born in High Wycombe in 1973, but his family moved to Wales when he was just six months old. He developed a passion for cooking for himself and his friends while at Oxford Poly, so when he moved to London in 1994 he headed straight for the kitchens of Marco Pierre White, Alastair Little and Sally Clarke. In 2001, Matt moved back to Wales with his wife Lisa, and together they opened The Foxhunter in Nantyderry, which won AA Restaurant of the Year for Wales in 2004 and was given the Perfect Pubs Best Food Award by the Daily Telegraph in 2007. He is a resident chef on BBC2's Castle in the Country and co-presents UKTV's Market Kitchen with Matthew Fort, Diana Henry, Tom Parker Bowles and Tana Ramsey. Matt is a regular contributor to various food magazines and publications.